With the Solstice energy working its steady magic the images of rebirth and transformation from the dark underworld of winter into the light of the child being born are potent. But in our modern world we have been separated from our myths of transformation and often we feel naked and alone as we travel this painful and unfamiliar place unsure of what to do and how to be in this experience. Our ancestors wove healing messages into these myths, encoding the story with messages of healing, of initiation rites,lighting the dark labyrinth of our soul with markers and guidance if we choose to see them. The story of Cerridwen and the Cauldron is one of transformation through this sacred symbol, and means of grace. . 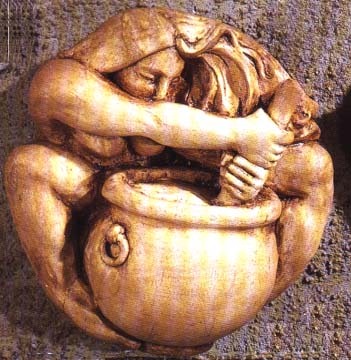 The water and herbs Cerridwen chose carefully are watched over and transformed within the cauldron through tireless and dedicated brewing by the Goddess into the Awen, the elixir of wisdom. This potent Awen transforms an ordinary boy into a wise man, the girl child into the wise woman through a series of chases, danger, pain and change as the elements unfold through the story. So how can we apply these ancient and sacred teachings to our modern lives?? The first step is to gain awareness, without fully understanding and coming to terms with the reality of where we are,( no matter how painful or unfamiliar) it can be difficult to move forward in wisdom. One way to develop our awareness is by gently focusing on the aspects of ourselves which weave together in the making of our present life. On a piece of paper or in your journal ( if your not journalling starting can be a powerful way of developing our awareness through telling our own story) draw a cauldron , Ive given and example. 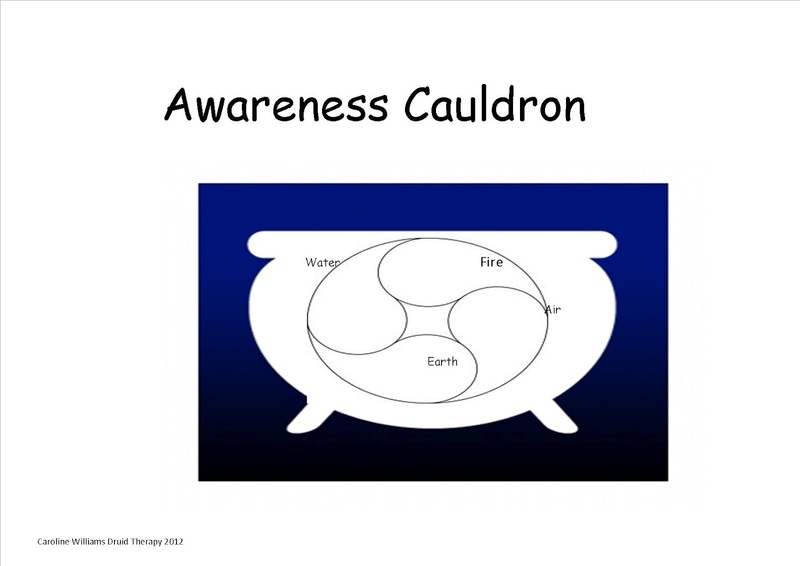 In this awareness cauldron are aspects of ourselves which flow, impact as they are connected to each other. Earth = our body, physical responses, sensations wellness and unwellness. Start with an event which has happened recently which has been unsettling and make sure this isnt something highly traumatic or to triggering. For example an argument with a work colleague or neighbor, you write this in the central space inside the cauldron. Include as much detail as possible and see how these aspects impact and relate to each other, they are connected and often we move through these aspects unconsciously. Over the next week or so just continue to be aware of these elemental aspects as they relate to you. Do you notice how you feel ( anger, crying or feelings of helplessness or no feelings at all)? Do you ignore bodily responses ( tiredness,over indulging,stress)Do you get caught up in over thinking ( usually unhelpful,going over scenarios, imagining what ifs) what are your actions ( avoiding people,too much tv,food,alcohol,smoking etc) because these are the ingredients we put in, add, mix up and brew inside our cauldron of transformation . By acknowledging these things we can then begin to transform this elixir into change and wisdom, we have both our trials and champions inside us! By being aware of what they are, we are able to navigate through life and choose the path we travel with wisdom well earnt and knowledge that sustains us. Until next time….keep stirring that cauldron ! !